Much thanks to Bryan Popejoy (pretty great instructor and my candidate for nicest guy in USA Muay Thai) for making this interview possible. The legendary Sangtiennoi Sor Rungroj recently made his first ever United States appearance as seminar instructor. The “Deadly Kisser” as Sangtiennoi is known earned his nickname by giving his opponents a peck on the cheek brief moments before knocking his opponent out or giving them a loss. I don’t use the adjective “legendary” lightly. 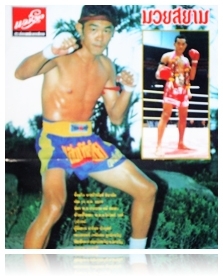 Sangtiennoi has fought a virtual who’s who list of Muay Thai greats from the golden era of Muay Thai (the 1990s) including Thai and foreign opponents. Among the foreign big names are Dany Bill (by my bias the greatest foreign Thai boxer of his era), Hassan Kassrioui and Ramon Dekkers. 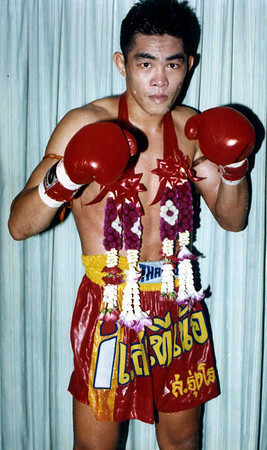 Among the top-tier Thai talent Sangtiennoi fought were Namphon and Namkabuan Nongkeepahuyuth, Cherry Sor Vanich, Orono por Muangubon, and Superlek Sornisaar. In every respect Sangtiennoi’s resume is truly legendary. As a trainer Sangtiennoi would have under his tutelage current big names of Muay Thai such as John Wayne Parr, Samkor Kiatmontip (also a former opponent) and even MMA star Enson Ennoue. The 1st and obvious question is what brings you to the United States for the 1st time? I came to the USA for the first time to put on a Seminar, and to teach Muay Thai at my friend Bryan Popejoy’s gym, Boxing Works. It’s said that you began Thaiboxing not because you needed the money but because you truly had a love for Muay Thai. At what age did you start and how did you become interested in Muay Thai? Yes that’s true, my first fight was only 100 baht. I didn’t think about the money, or to make myself famous or anything, just because I love Muay Thai. I started at age 13. When I was 8 years old, I used to see all kinds of fighting, like fish fights, chicken fights, etc. So I see fighting all of the time! I wanted to fight, so I went to a gym close to my home, called Look Bangkadee Gym. You are probably most famous internationally for your fights with Ramon Dekkers. What was the total number of times you two actually fought? 3 times: first time was in Japan, I won on points; second fight was in Lumpini Stadium, I also won on points. Third fight was in Holland, I lost on points. Of the foreign boxers you’ve fought who in your opinion was the most difficult to fight and why? Dany Bill. Because he had really good technique, and was tricky. He fought more like Nak Muay Thai, instead of farang. 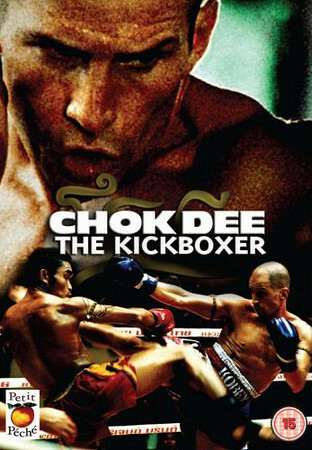 Ramon was more power and strength, Dany was more technique, like Jocky gym style, like Lerdsila, like Somluck, or like Saenchai. For those in the United States who may not know you’ve actually had a role in Dida Diafat’s film ‘Choke Dee’. How did this project start? Ajarn Kimyu Sor Ploenchit called me up, and said they were making a movie. I said “who is making a movie, what kind of movie”? He said “a French Company, and it’s a movie about Muay Thai”. I asked to see the script, and I saw the role they wanted for me was a teacher, so, I took it. That was my first time for acting. What was your fondest memory of the film? There was a part in the movie where Dida had an important fight, if he would lose the fight, the gym owner would not want him any more. I was working the corner. In the fight, Dida was cut and bleeding, and ended up losing, but gained the fans and the camp owners respect, because he fought hard. What was your total fight record and the time that you retired? I fought around 200 times, but I cannot remember exactly how many wins and losses. I had a notebook, I used to keep track of everything, wins losses, how much payment, but a reporter once borrowed it for a story, and lost it! So, I don’t know for sure. When you finally retired I often wondered what made you retire as it was just 2 years past the time you captured the Lumpinee (originally I thought it was Rajadamnern) Stadium championship. What prompted you to retire? It was the Lumpinee title (lightweight), I was 31 years old. At 32, I opened my own gym, and was still fighting. At 33 I stopped because I was having problems with my shoulder dislocating, so I stopped. Many fans of Muay Thai consider you to be a legend in an era when Muay Thai competition was at its best and most difficult. Who in your opinion in the modern era stands out as a great Thaiboxer? Foreign or Thai? Of modern times, I like Buakaw. I like the way he uses his left tiip, left kick, and left knee. He is strong, and has good power, but doesn’t look that stylish. Do feel the level of Muay Thai in Thailand has declined since you were an active boxer? Yes, I think so. Because the gambling and the gamblers have such a control over things. It has caused the fighters to fight to please the gamblers. Now that you have taught American students what do you think Americans need to learn more to be better at Muay Thai? I was surprised actually, because it is so far from Thailand, but I think the people here have good technique, good form. I think the biggest problem is not enough fights here for the fighters to get experience. If the USA can have more fights, and a fighter can fight once a month or every 6 weeks, everyone will get better. When you were actively fighting what did you consider your best asset in the ring? I think that because I love to fight, and I knew that I had to train hard, and I did train hard, that was my best quality. I loved what I did and prepared for it. you teach your boxers that separates your gym from others in Thailand? I have been a boxer, and now a teacher, and now also a promoter. So I know the many different parts of the sport, so I can guide my fighters properly. You’ve taught many famous students such as Samkor and John Wayne Parr. Who do you have as a student now that fans should look out for? Farsawang Thor Sangtiennoi, who is Rajadamnern 105 lbs Champion, My Son Moses, who is S-1 Champion. I have 3 other boxers Tiankao,Thanonchai, and Palangchai, who are well known in Thailand, but I think they, and Farsawang will be more well known internationally. Because now, they are small in weight, and foreigners seem to know the bigger boxers like Nalupol, Yodsaenklai, Sakmongkol, etc. But the lighter fighters are better known in Thailand. What things will Muay Thai need in order to become a bigger sport outside of Thailand? In Thailand there are 2 groups…one group is the gamblers, who want to keep the sport as it is, another group wants to promote the sport and the art, and get Muay Thai into the Olympics. If the second group can get this to happen, it will help Muay Thai grow around the world. What was your proudest achievement in Muay Thai? The first day I trained Muay Thai, my mother hit me! And the camp owner didn’t want me, either. But, I was very stubborn and never gave up. And Muay Thai has been my life, it has supported me, and taken me around the world. So, I’m more thankful for Muay Thai than proud of any one of my own achievements. How has your time in the United States been so far? First time here, I am surprised, because there are many old friends here, like Kaensak, Kongnapa, Saekson, Lookchang, etc. But, the country is so big, it is impossible! I thought it was more like Thailand, everything much closer together! Other than that, I like it a lot. I’ve enjoyed teaching here, and have made many new friends, and staying here is like staying with my family. Everyday, I came home to Bryan’s house, and have dinner with Tik, Tak, Net, Bryana, it is like family. Will you visit the United States again? I hope so, I want to come back, and I want to have my son fight here in the USA. I want to come again and stay with Bryan and teach at Boxing Works again. Do you have advice for new students in Muay Thai? Learn to fight with proper form, and practice everyday to get your timing. What last words do you have for your fans? Thank you all so very much. I didn’t imagine that people would be so interested in Muay Thai, or interested in me, or knew who I was. I didn’t have internet, or anything, but was surprised that people know me and put my fights on the internet. I’m very grateful that people are interested in Muay Thai, and I hope to keep teaching Muay Thai and meeting others who love Muay Thai like I do. 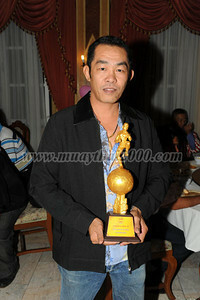 Again, Khoob Khun Mak Krup, Thank you all very much! Much thanks to Bryan Popejoy, all at Boxing Works and Sangtiennoi for making this interview possible. It was truly a rare honor to interview Sangtiennoi. ~ by fatsoking on July 19, 2010. Great interview! Sangtiennoi really comes across as humble and inspirational. Thanks for the great interview! Sangtiennoi has always been one of my favorite Nak Muay. I’m glad to see him confirm my belief that the ’90s were the golden era of Muay Thai. Haawp Koon MAK MAK, Ka Sangtiennoi for training Mike and I in Pathum Thani at BAAN Muay Thai School in Thailand as well as in both semminars here in the USA!!! what ‘s tha adress of the gym?